Rear Adm. F. S. Withington, Chief of Bureau of Ordnance; Rear Adm. M. F. Schoeftcl, former Chief of Bureau of Ordnance; Rear Adm. P. D. Stroop, Deputy Chief oi Bureau of Ordnance. Capt.. E. B. Hooper. USN, Asst. Chief of Bureau for Research and Division Director; Capt. B. C. Lovett, USN, Asst. Division Director; ("apt. E. E. Christensen, USN, Asst. Director Aviation Ordnance; Comdr. II. II. Klare,Jr.. USN, Lt. Comdr. N. F. (Campbell, USN, Lt. W.J. Kwitkoski, USN, N. V. Toussaint, DM2. USN, and Miss Dorothy White. A vial ion Ordnance Branch, Bureau of Ordnance. Messrs. Val A. Browning, M. Bigelow Browning, Matt S. Browning, Ma rr in er A. Browning, and John Val Browning, of the Browning Arms Company. Capt. H. Hull, USN, Comdr. E. L. Dashiell, Jr., USN, Comdr. F. H. Price. USN. Mr. L. L. Henry, Mr. R. M. Decatur, Mr. MatthewGradijan, Mr. F. W. Holtzbcrger, Mr. R. L. MacKcnzic, Mr. R.J. Martin, Mr. J. F. X. Mayhcw, CWO R. S. Harris, USN, and CWO P. L. Chisolin, USN, Naval Gun Far,tory. Capt. E. S. Keais, Capt. S. B. Strong, Capt. R. N. Sharp, Capt. J. M. Elliott, Capt. T. H. Ahroon, Capt. J. E. Clark, Capt. W. R. Smith, III, CapL Richard Matter, Capt. F. B. Miller, Comdr. J. J. Hinman, III, Comdr. W. R. Staggs, (Üomdr, D. W. Snivcly, Comdr. Paul Pugh. Comdr. Marvin Franger. Aviation Ordnance Chief"J. W. Cospers, U. S. Navy. Col. R. D. Salmon, Col. L. S. Moore, Col. C. T. Man ¡sou. Col. R. E. Galer, Col. K. D. Krrliy. Col. R. H. Richard, Lt. Col. W. E. Clasen, Lt. Col. F. E. Hollar, Lt. Col. Gay Thrash, Lt. Col. L. O. Williams, Lt. Col. E. W. Kcllcy. Lt. Col. H. Ross Jordan, Maj. Donald Fenton, Maj. J. L. Hcrndon, Maj. E. Anderson, Maj. Charles Guy, Capt. G. C. Daskalakis, Capt. J. H. I.awson, Capt. H. Leroy, Lt. P. L. Lockaby, Lt. John Elliott, CWO John Scarborough, CWO F. C. Petet, M. Sgt. B. C. Woods, M. Sgt. P. L. Balarezo, M. Sgr. J.J. Lang, M. Sgt. Morris Waldorf, M. Sgt. R. O. Bennett. M. Sgt. Burl Hayes, M. Sgt. Robert Alsop, M. Sgt. Ben Madden, M. Sgt. T. E. Gitz, M. Sgt. Robert Parks, M. Sgt. C. B. Robinson, M. Sgt. T. A. Ward,Jr., T. Sgl. H. E.Johnson, and St. Sgt. George Nelson, Jr., U. S. Marine Corps. Capt. T. K. Wright, USN. Comdr. L. W. Van Antwerp, USN, Mr. N. D. Marden, Mr. Thomas Crutcher. Mr. Louis Ehrman, Mr. William Jewby, Mr. Philip Grier, Mr. William Blaine, Mr. Augustus Grueter. and Mrs. Rachel Hall. Naval Aviation Ordnance Test Station, Chincoteague, Va.
Mr. H. P. White and Mr. B. D. Mnnhall, H. P. White and Co.; Mr. Herman P. Dean, Standard Publishing Co.; Mr. Leo X. Abernethy. Bureau of Aeronautics, U. S. Navy Dept. : Mr. John H. Moore, Eastern Glas Laminates, Inc.; Col. George W. Hicks, Pittsburgh Post-Gazette; Mr. J. J. King, author and international big game hunter; Col. Melvin M. Johnson, Jr.; Mrs. Ruth H. Stoeger; Col. Leo A. Codcl and Mr. R. E. Lewis, American Ordnance Asso. ; Dr. S. G. Green; Mr. H. Peterson, National Park Service; Lt. Col. E. Naramore; Maj. Gabriel D. Moncada; Maj. Alonso Aguirrc Ramos; Sr. Domingo G. Canez; and the late Col. Calvin H. Goddard, USA. Mr. M. S. Solomon and Mr. R. E. Landon, Government Printing Oilice. Dr. Remington Kellogg, Director, U. S. National Museum; Mr. P. R. Garber, Director, U. S. National Air Museum; Mr. M. T,. Peterson, Curator, Military History: Mr. C. L. Goins, Jr.. Museum Curator; and Mr. J. R. Sirlouis, Asst. Museum Curator, Smithsonian Institution. Col. J. J. Drisc.oll and Col. F. S. Allen, Jr., U. S. Air Force. The Hotchkiss Memorial Library, Lakeville, Conn.; Olin Mathicson Chemical Corp. Deep appreciation is expressed to Maj. Gen. J. S. Hatcher, USA Retired, Col. F.. H. Harrison. USA Retired, Mr. W.J. Howe, Mr. W. D. Waite. Mr. J. A. Harper, and the staff of the National Rifle Association, who upon many occasions acted in the capacity of an advisory hoard and willingly gave needed assistance drawn from their long and colorful carccrs spent in the art of weapon development. The untiring personal interest, guidance, and professional advice of Mr. Henry Marschalk, Head. Publications Branch, Bureau of Ordnance, is largely responsible for whatever measure of success the four volumes of "The Machine Gun" have achieved. Special thanks are extended to Col. G. R. Jarrett and the start* of the Library and Museum Branch, Aberdeen Proving Ground, for their splendid cooperation, especially in loaning representative weapons for illustration. For their excellent cooperation and service thanks are extended to the staffs of many libraries, museums, and other activities which were consulted. These institutions include the Library of Congress (where particular gratitude must be extended to Col. WilJard Webb. Chief, Stack and Reader's Division), the National Archives, Main Navy Library, Bureau of Ordnance Technical Library, Bureau of Aeronautics Library, Ordnance Technical Museum, and the Pan American Union Librarv. Having no precedent as a guide, Mr. James Fleming has performed an outstanding task in setting down the mathematical and engineering analysis of the basic systems of automatic fire. 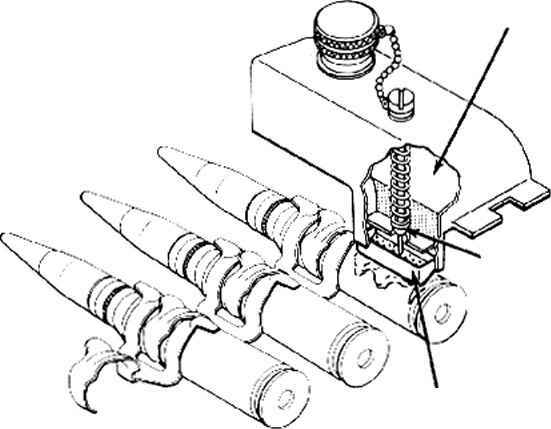 Pioneering in one of the most debatable fields of ordnance, he carried out this analysis from the practical, as well as the theoretical, side of ordnance, making use of field reports, research studies, personal observations, and actual physical participation in firing tests any time the apparent solution to the problem contained an clement of doubt. Mr. Edward Hofischniidt, internationally known for his drawings and articles on firearms, has demonstrated great originality and resourcefulness in preparing the illustrations for this work. Despite their great volume, he has carried the same high quality and attention to detail into each picture. I lis unusual skill in bringing out features of automatic mechanisms of varying calibers and projecting them in a standardized form demonstrates his thorough knowledge of weapon design. One cannot overestimate the importance of the part played by Master Sergeant George Mc-Garry. USMC, in the completion of this publication. Sergeant McGarry's task in disassembling practically every known automatic firing mechanism and studying it in order to highlight its outstanding features was performed in a skillful manner thai reflects the quality of his extensive background in automatic weapons. The text has been edited by Mr. Franklin W. Clark, who displayed not only professional competence in the technical details of organizing a complex manuscript into readable form, but a unique ability in coordinating controversial subject matter varying from the elementary to the technical in a manner that minimizes the inevitable questions that arise.